While larger industries struggle with shrinking credit markets and reduced consumer spending, cottage industries such as the artisans represented by West Virginias MountainMade, http://www.mountainmade.com, are reporting growing interest in their handmade goods. In the past year, for example, global manufacturing operations such as U.S. automakers have had to seek bail-out funding and retailers of mass-produced commodities have floundered under the burden of inventory that doesnt seem to interest shoppers. The National Retail Federation this week announced its forecast of a 1% decline in November and December sales. As the global economy continues to recover from the worst economic crisis most retailers have ever seen, Americans will focus primarily on practical gifts and shop on a budget this holiday season, said NRF Chief Economist Rosalind Wells in a press release. Meanwhile, said Becky Henderson, general manager of West Virginias MountainMade, interest continues to grow in the handmade craft and art market. This month, MountainMade will relaunch its website, which will provide an ecommerce platform and a social network allowing artists to connect with supporters and show off their craft using blogs and high-definition video. The redesigned web platform will also allow shoppers to share their stories and feelings inspired by the artist creations through photos, ratings and reviews. Along with Americans looking for cars that get better gas mileage or fair trade coffee, more and more people are looking for a higher level of quality in the items they buy, and they want to know that someone made those items in a responsible fashion, Henderson said. Henderson said MountainMades mission is to help connect those savvy and judicious customers with heirloom-quality works that meet their need for more than just stuff. MountainMade conducts the business and marketing on behalf of a select, juried pool of West Virginia artisans, including media such as ceramics, paintings, quilts, hand-hewn instruments and furniture, glass and music. Many MountainMade artists are reporting steady sales and interest across their marketing activities. The artists regularly travel in and out of West Virginia, attending fairs and other events that showcase their work. The artists report orders keep coming in. Michael Offutt, a MountainMade artist from the Grantsville area whose woodworking has brought him a global reputation, said it didnt take him long in the handmade industry to realize people were purchasing more than just one of his wooden bowls. They were buying a piece of me, Offutt said. Offutt said part of the satisfaction he derives from being a creator of handmade goods is knowing that peoples purchase connects them, that those people very often pass on those items as gifts to their friends and family, and thus the connections deepen across generations. Offutt pointed out that such connections dont occur with mass-produced items found at big box stores. Offutt added that technology such as MountainMades ecommerce platform is opening up a new, global market for West Virginias craftspeople markets that many people didnt even know existed. He said its a means to sharing Appalachian trades and traditions with a larger audience. MountainMade is part of a larger, national trend of emerging interest in handmade goods, sustainable production of goods and do-it-yourself manufacturing. In the past year, explosive growth of websites such as Etsy.com, Artfire.com and Craftster.org are emblematic of this movement. BuyHandmade.org, a consortium of art and craft communities, includes a petition on its website in which supporters promise to only purchase handmade goods. The list includes more than 43,000 registrants. 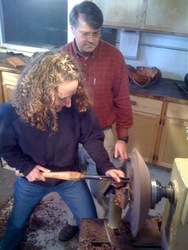 Centuries ago, this was just a way of life you made your tools to make your bowls, or even your own house, Offutt said. We used to make baskets to gather eggs, for example. Nobody ever thought that people would buy the baskets, that they were worth anything. Until MountainMade came along, we didnt really have any idea.